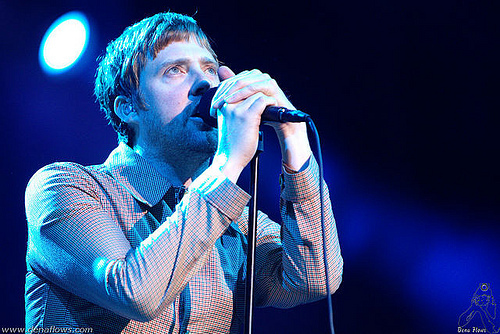 Kaiser Chiefs are have been one of the most prominent British Indie bands in recent years, having released four albums, each of them featuring in the top 10. With such memorable hits as ‘Ruby’ and ‘I Predict A Riot’ they have climbed their way to the top of British music. TNS caught up with charismatic lead-singer Ricky Wilson during their current tour of the UK. Brilliant thanks; I’m really looking forward to the gig tonight. Tell us about your new single, 'On the Run'. It’s another direction change for us. We kind of get bored very easily with treading water so this is a musical change. It’s quite anthemic and very keyboard led, hopefully it will get people dancing again. How have the fans been reacting to it on tour? We’ve only played it two or three times so far, but the fans seem to be amazed by it. It’s a bit different for us, it’s not as guitar heavy and angsty as they are used to, but they seem to like it. Not at the moment, no. We just have two songs which will be featured on the US release of The Future Is medieval. The record is only just coming out in America so we wanted something fresh to go with it. Do you agree with bands like Black Keys when they say guitar music is dying? I don’t think it’s dead; it’s never dead is it? It’s just not as popular at the moment. Personally I think there’s more guitar bands around than ever before. At the moment the charts is dominated by RnB and singer-songwriters but I’m sure there’ll be resurgence. With your latest album, The Future Is Medieval peaking at 10 in the charts, does this show rock music is still commercially viable? To honest, four albums in I don’t care, I’m just enjoying being together as a band. But I do think this generation is desperate for the next Nirvana or Oasis to grab hold of the teenagers and get them back in gigs, and fire up other bands in the genre, so I hope they’re round the corner. A movement like Britpop perhaps? Yeah, because that’s what I love about music, it brings people together with its movements and trends. Like when we were out, there was a mini revival of British bands, with bands such as Bloc Party, The Kooks, Futureheads etc. all selling a lot of records but it’s kind of died of a bit. Hopefully the new generation are rehearsing at the moment. After your UK tour, you embark on a US tour which is your biggest to date. How does it feel to come back to such crowds? It feels great, after three years it’s great to come back to bigger crowds than before. We’re actually heading over there twice this year. We’re going after the UK tour for three weeks, then off to Australia and back to the US again. So we’re definitely looking forward to it. After being in a band for all this time, do you still get the same feeling every time you head out on tour? Yeah, I think so. The first time you go out on tour you don’t really know what to expect, but now we really know what to expect. We’ve had to start from the bottom, and it’s given us a sense of grounding. We know what it’s like to play stadiums, but we also know what it’s like to play toilets. Do you prefer playing festivals and stadiums or the intimate shows where the fans are singing back your every word? I don’t know, they’re all a bit different really. I like the festivals because it’s a bit more of a challenge when the crowd aren’t necessarily your fans, so you feel like you have to prove yourself. But with your own crowd, you know it’s a bit more of a celebration, with 80% of the people there at the very least liking you. I prefer playing the massive stadiums I’d say. Do you have any plans to play UK festivals this year? Hopefully we will be. Now is the time when promoters start to negotiate are so its all very much in the air at the moment. But we’ll definitely be in Europe. We’re fortunate enough to be fairly big everywhere so we’ll do two or three festivals in each country before we head back to the UK. Does it feel any different to play a foreign festival? No the fans are just as eager, and they really know how to put on a festival in Europe! I thoroughly recommend people go to the European festivals; they get some really good bands in. Not to mention it’s no way near as rainy and muddy.